As we approached, a slice of paradise was becoming ever more tangible. I can quite confidently confirm that I live on one of the most beautiful places on Earth. Having travelled all around Lombok, from North to South and East to West, I have seen the Magnificent Mount Rinjani, the beautiful white sandy beaches with aquamarine seas, rolling rice paddies, exotic atolls and, the smiley, friendly ‘Sasak’ people who make this island what it is today. All my sentiments were confirmed once again, however, when I recently discovered two exquisite islands off the East Coast of Lombok - Gili Kondo and Gili Bidari. These two tiny islands are located in the district of Sambelia, East Lombok. It was 8am and it was time to get up. Hopping in the car at Senggigi on the west coast of Lombok, we headed East to explore Lombok’s natural surroundings. Driving through beautiful terraced rice paddies, we passed by buzzing market stalls, bustling traders, which were buzzing with people purchasing their goods for the day, magnificent mosques and millions of motorbikes. Along the way we stopped at some enormous trees that towered over us, casting the surroundings in shade. When we questioned Pak Sabri - our guide for the day - he replied saying that they were originally planted by the Dutch and have become known as ‘The Giant Trees'. True to his word this, they were colossal . After snapping a few photos, we were on our way again. After a three hour journey we arrived at ‘Gili Lampu Harbour’. Pleased to be able to stretch our legs we got out of the car, gathered our belongings and were taken to a little restaurant which had prepared an Indonesian feast for our lunch. It consisted of a delicious concoction of rice, tempe, tofu, sop sayur(vegetable soup), fish, chicken and jack fruit curry. With our tummies full and our hearts content, it was time to hit the road again. We set off in a large wooden boat. We sped past another group of tourists and waved as they plodded along. I could see three islands far off into the distance. As we approached, a slice of paradise was becoming ever more tangible. The first island we discovered was Gili Kondo. Here the sea was so clear you could see the underwater world beneath without having to put a snorkel and goggles on and the sand was like pure white powder. The island had a restaurant and a couple of bunaglows so travellers could spend a night or two. ). Otherwise the island was beautifully remote, filled with only lush green vegetation and t a couple of berugaq’s. We walked halfway around the island completely dumbstruck, taking in every little step as we were captivated by the different blue hues of the sea, complimented by the pure white sand. Plunging into the sea with our snorkels and masks, was truly incredible. We saw so much colourful coral and tropical marine life, all nonplussed by our obvious presence. After our snorkeling session, we lay on the beach for a while, soaking up the sun and just enjoying the true beauty of the island. After two hours passed, we thought we should head on to the next stop on our island itinerary – Gili Bidari. As soon as we climbed off the boat,I was in heaven! The sea was a turquoise blue that one only ever imagines, the sand was so soft and white, seeping through our toes as we walked amongst it. The best part, however, was that we were entirely on our own, with not even a single soul in sight. The beach was ours! We walked around the island treading in rock pools,discovering beautiful coral and staring at blue starfish and other species of the sea. 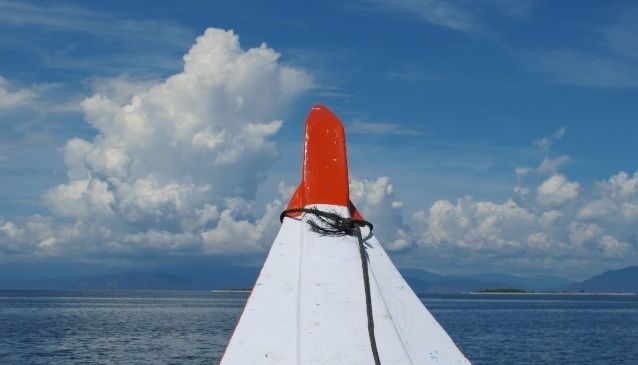 The view across the ocean was just breath-taking with Sumbawa staring right at us. In the distance we could see the ferries crossing over from Lombok to Sumbawa. Around 3pm it was time to head back to the harbour. We climbed on the boat, made sure we had all of our belongings and waved goodbye to our little slice of untouched paradise. However, as I stared at the looming grey clouds on the horizon, hanging directly above Mount Rinjani’s angry face, I knew it would not be a lasting goodbye.